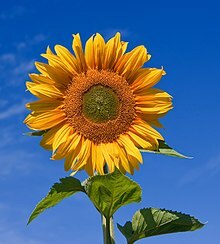 Helianthus (frae the Greek: ήλιος, Hēlios, "sun" an ανθός, anthos, "flouer") L. is a genus o plants comprisin aboot 70 species in the faimily Asteraceae. ↑ 1.0 1.1 "Genus: Helianthus L". Germplasm Resources Information Network. United States Department of Agriculture. 2011-01-06. Retrieved 2011-02-22. ↑ Helianthus. Flora of North America. ↑ "Sunflower Production". North Dakota State University. Retrieved July 12, 2016. This page wis last eeditit on 5 Mey 2018, at 23:53.